What do southern lawyers do in their spare time? Some hunt, some fish, others play golf. If you're Tom Dennard, you travel abroad in a pair of jeans and a Led Zeppelin t-shirt, and you build a youth hostel that attracts global travelers to your doorstep. Growing up in the tiny town of Pineview in the southern part of Georgia, every neighbor's home was open to Tom, so it was only natural that he assumed the same would be true when he ventured forth into the world. R Equipped with little more than a passport & backpack, he's crossed thresholds from Appalachia to Africa, Brunswick to Bulgaria and Cuba to Costa Rica. In the 1970s he started keeping journals of his travels. 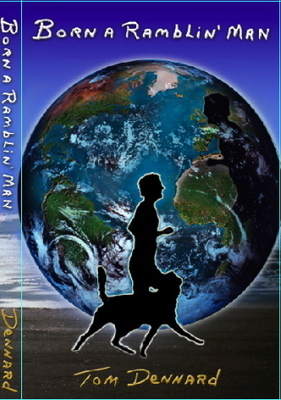 From those frayed, tea-stained pages comes 'Born a Ramblin' Man, your personal passport to a world of intriguing cultures, colorful characters, bizarre encounters, and narrow escapes. His close calls - particularly in Communist Bulgaria - make one wonder whether Dennard was born under a wandering star, a lucky star, or both. But for all the far-flung adventures, his most humorous and poignant tales take place on Georgia soil. A magical amalgam of European and African descendants whose roots, memories, and shared experiences run deep into its red clay and sandy river bottoms. Stephen Doster: author, Lord Baltimore. Valid XHTML | Valid CSS | Copyright© Tom Dennard 2007 - 2019. All Rights Reserved.